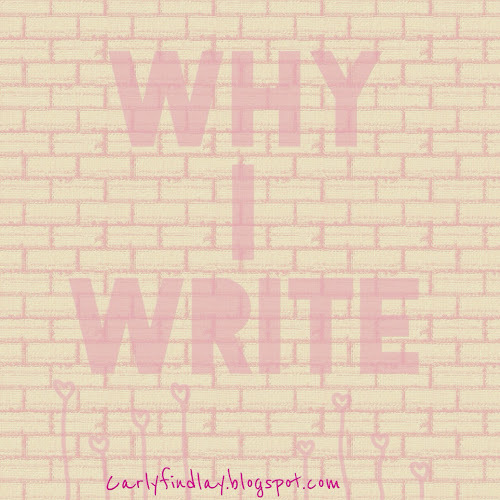 Tune into Radio Carly: Why I write. I write to tell the world my story. I write to be published elsewhere. I write because I love seeing the blank screen turn into something that others enjoy reading. It's like packaging my thoughts and sending them out to the world to help others. 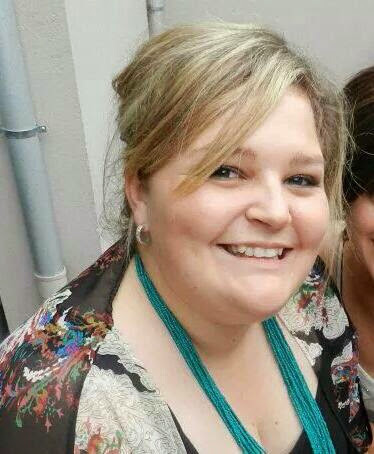 I write to change people's perceptions of what it's like to look different, to influence situations like being abused by a taxi driver and then helping change the driver education, and having my photo misused on Reddit and responding to those trolls. I write to learn about myself. And boy have I learnt about myself since I started this blog. I've learnt my strengths and weaknesses and how to be outspoken and how to take criticism and how to be confident. I've learnt how to be a responsible public servant and social media user. I've learnt to put myself forward and not to get down when I don't get opportunities. I write for myself but I am mindful that the more readers I have, the more I try to put out consistently quality content. And often I get stage fright, performance anxiety. I procrastinate because I don't think the words will be good enough. Hell, I took ages writing this post, saying out loud "now I will write". I also write to learn about others. I leave anonymous comments on because I believe there are more good people than bad out there and the anonymous comment option makes people feel safe enough to reveal something about themselves on the internet. I love how me telling my story empowers others to tell theirs. I love how my readers share a piece of themselves in their comments - or identify with what I've written because they have experienced similar. And I'm so thankful. There aren't too many Australian chronic illness blogs that I know of. Those I do read are beautifully written and so powerful. I sometimes feel like we are in an under recognised niche - ignored by brands. But then I realise how much we are helping eachother and our readers with chronic illnesses and disabilities. We've got readers that span across all genres of blogs. And we really make a difference. I can bring honesty, authenticity, humour, advocacy and activism though my blog. A new mother with a baby born with Ichthyosis. A person who had reservations about talking to someone who looks different. Someone who enjoys good writing. Less alone, relieved they've found someone else experiencing this rare condition, uplifted, educated, informed. A changed perspective about people with visible differences. Less alone. Uplifted. Part of a community. Gathered my thoughts. Blogging is therapy. Excited to do a doctorate in blogging empowering people with disability. I am working on blog posts and freelance articles. I'm also working on some speaking points for the MWF and PBEvent plus some other talks I have coming up. I should be working on my memoir manuscript and getting invoices for writing done. 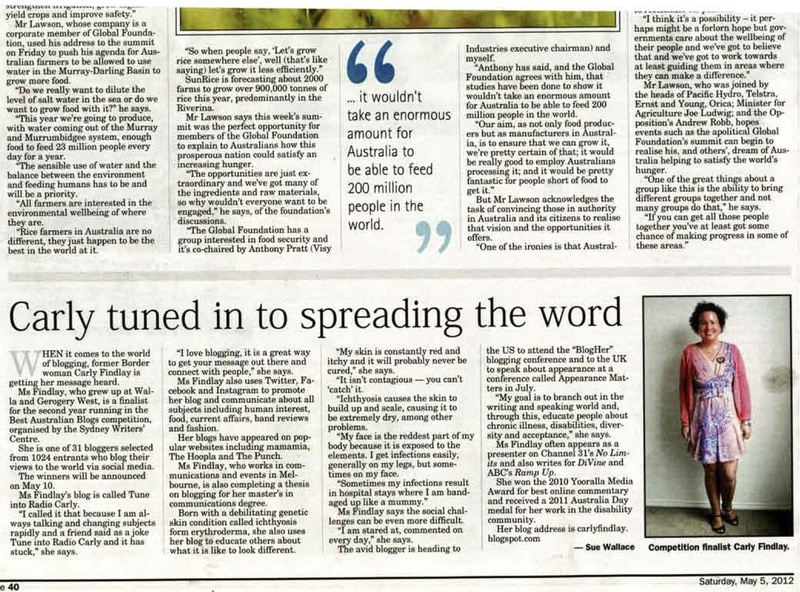 I write about myself and my condition to remove the sensationalism that surrounds Ichthyosis. Writing is cathartic and it brings me support from readers who are experiencing similar. Writing a blog also means that I can control the level of information I put out there (and that the public isn't misinformed about my condition). Sometimes I worry that through so much writing and speaking about Ichthyosis, it defines me in a bad way. This has been hinted at by some people. But identity is important, something to be proud of. And writing about my Ichthyosis and appearance so candidly has helped me feel a part of a community and feel more confident than ever. It's also opened up more opportunities than I could ever have imagined. The more I write about appearance diversity, the more I want to learn about it. It's interesting and diverse and it's my niche. There will be critics, and perhaps I'm sensitive to them because I love and am proud of what I do. But I try not to let them weigh me down. I just keep on. Writing a personal memoir in blog form can be viewed as very narcissistic and self indulgent. It is, I admit. It's nice to have the time to write about myself (and even nicer that people read it, and also pay for my words). I really like this article that Todd sent me - confessional writing is not self indulgent. I sometimes batch write blog posts on a Friday or Saturday night – usually over a glass (bottle!) of wine and by the fourth glass, my writing gets more animated! I schedule my posts for 7am weekdays. I write a lot after I finish my day job – maybe two hours two or three nights a week, and if I haven’t finished something I wake up early and write before work. I try to set aside three hours on the weekend to write too – either freelance articles or blog posts. I write in my day job too – a different type of writing though. I use my iPhone and iPad notes function the most. They are synced so I can pick up where I left off anytime and anywhere. I often write whole blog posts or articles using my phone on the train to work or while I am waiting for a friend. I don’t often use a computer. Sometimes I handwrite notes for myself but most of my writing is electronic. I’ve always got drafts on the go. If I'm not well (which has been recently) I can usually still write, but I will do less of it because I am worried about the perception - if I'm home from my day job, how can I be well enough to write freelance, or even for my blog? I don't apologise for not blogging - I wrote about that last week. Life gets in the way. If I'm really tired and think I should blog I will just post some pictures of travel or street art. I will also develop a Facebook status I wrote about something I'm passionate about. Sometimes if I write a FB post that gets a great reaction (conversations and likes) and I quite like the topic I've posted about, I convert it into a blog post and write more about that topic. I did a few of those on holidays where i was too tired to blog but just wanted to get something written about my day. I copied my FB post into my mac notepad and then developed a blog post at a later date. Worked well! I've also got a lot of guest posts to edit and schedule - these work well when I am busy or sick, but they are usually more work than a blog post I write from scratch because of the editing, writing a lengthy introduction myself and follow up with the guest poster. 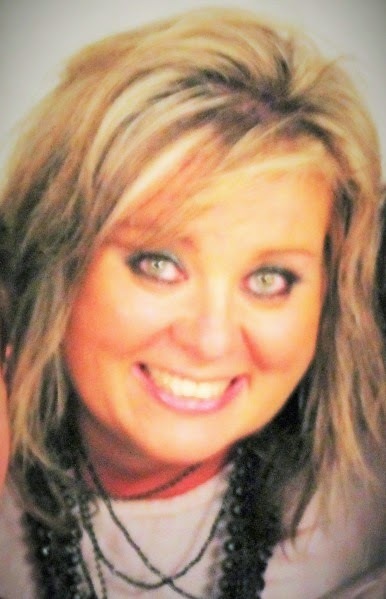 The Why I Write blog hop was passed to me by Lisa who blogs at Country Gypsies. Lisa is a single Mum of two teenagers, and a primary school teacher, who left Sydney six years ago for a tree change to the Southern Highlands Of NSW. Her family loves to travel, with their aim being reviving an old vintage caravan into a retro style and heading off on a big road trip. A good dream! She likes to say her writing is champagne comedy on a beer budget!!!! In the spirit of showcasing brand new bloggers, I'm passing this on to two of my Blog With Pip classmates: Tash and Jade. Tash writes at Stuff From The Suburbs and often posts about all of the imporant things-hair cuts, how she always knew Thomas from Offspring was no good, the awkwardness of going to a singles night-that pops into her head at work when she should be..ahem..working. She also occasionally writes about dealing with depression and anxiety too. She gets told to use her 'indoor voice' quite a bit, and can tell you where the good places are to find a good Iced Coffee in Ballarat, where she currently lives. Tash is also uncomfortable writing about herself in third person. 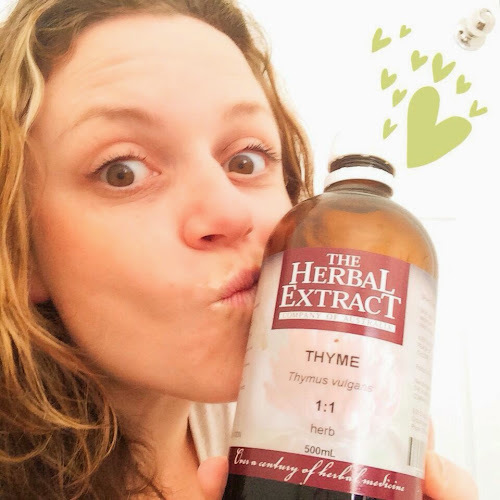 Jade is a naturopath from Sydney who blogs at Thyme and Me. She has a strong desire to make natural medicine more user friendly for everyone and show just how effective it can be. Go say hello to Lisa, Tash and Jade! They'll be sharing why they write soon. And tell me, why do you write? 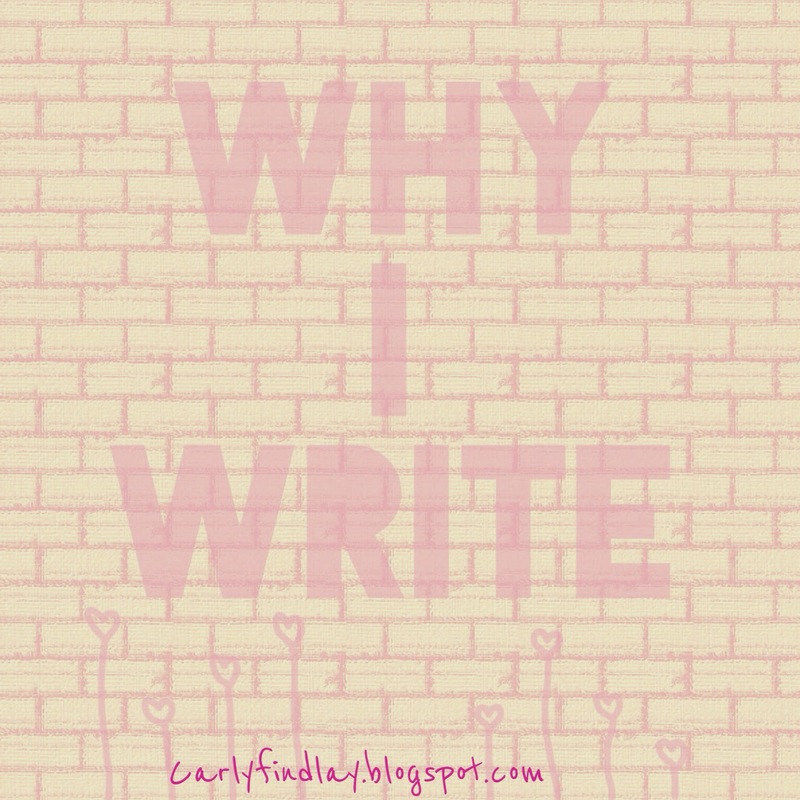 Why do you read blogs? It's a sign, Carly! Yours is the second highly motivating post about blogging I've read today. Like you, I write because it lets me relate my thoughts to others but it's also a bit of a debrief and download for me. Win win situation. It's a relaxing way to write Deb! I must start increasing my alochol intake when I blog! "It's like packaging my thoughts and sending them out to the world to help others" love that sentiment. Hi Carly. I'm glad to have found your blog through the Networking Circle. I appreciate the work you are doing to help break down barriers and address the way people react to diversity. I write to try to help people see diversity as a good thing, and to help break down the barriers disabled people experience in society. I mostly write about being a parent to Autistic kids, and my efforts to advocate for them. I sometimes write about Bipolar as my hubby and one daughter are diagnosed bipolar. I write to process my thoughts, document my journey and to support others. It's tiring and rewarding.